It is always a welcome to sit back and relax while someone else cooks for you. It is especially a blessing when that person is your mother. I have always enjoyed my mother’s home cooked meals. These meals are not just traditional, but show my heritage and how Trinbagonians use the food available to them. We are a creative people and many dishes have evolved to reflect us and our circumstances. 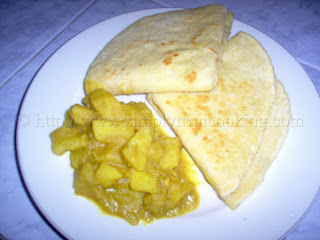 Last evening, for dinner, I asked my mother for something different so she decided to make dosti roti and curry aloo. Now, I haven’t eaten dosti roti for a long while so it was more than a welcome than the usual sada roti. 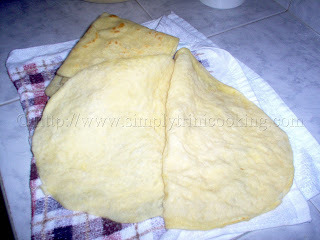 Dosti roti is another type of roti we make in Trinidad. It’s commonly called “two in one” roti because of how it’s made. When making it, two balls of flour (loyas) are rolled out together, so when you cook it you are cooking both of them at the same time, that’s why they are called Dosti or friends. Don’t worry about my explanation, I took enough photos to show you how it’s made. Heat oil in a heavy pot. 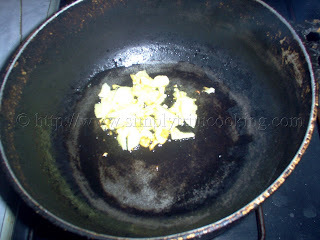 SautÃ© onion and garlic for 1 minute. 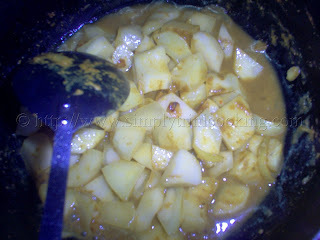 Mix curry with ¼ cup water and add to onion and garlic. Cook for a few minutes until thick. 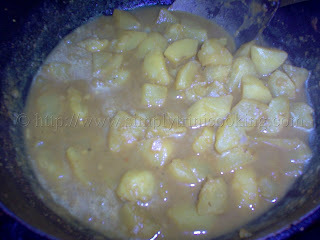 Add potatoes to the curry and stir until the curry coats the potato; add salt and pepper and continue to cook for a few minutes. 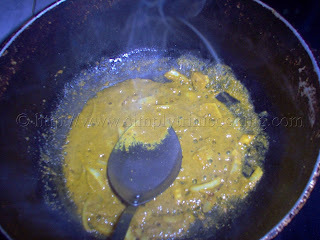 Stir in water.Cover the pot and lower heat. 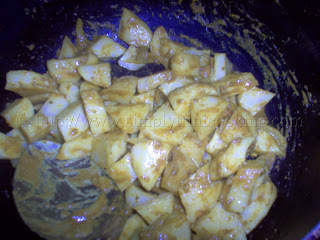 Cook the potatoes until they are tender and liquid has thickened.Season to taste. If more sauce is desired add more water. In a large mixing bowl, mix the flour, baking powder and salt. Add 1 1/8cups water all at once and mix into a soft dough. Add more water if necessary. Knead dough (folding and sealing until smooth). Cover with a damp cloth and leave to relax for ½ hour. Knead once and divide into 8 balls (loyah). Allow to relax for 15 minutes. Then shape the balls into a circle 4″ in diameter. 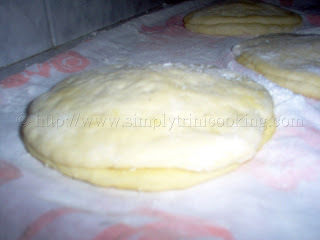 Spread butter or oil on top the first circle and top it with another. 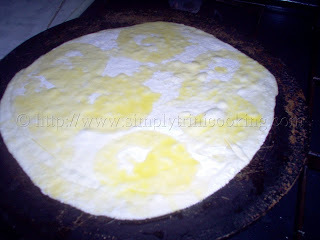 On a floured board or clean counter roll out the two roti together with a rolling pin. 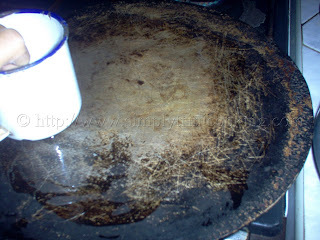 Lightly grease a hot baking stone or tawah. 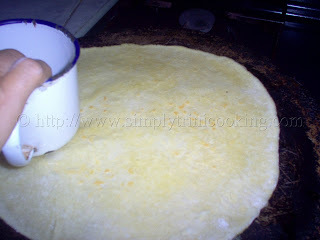 Then place the rolled out dough on the tawah until it is cooked on one side. Turn over and cook the other side. Remove and place on a clean towel. Insert knife between the two layers and separate to allow the steam out. Keep warm in a clean towel. The Dosti Roti and Curry Aloo ready to eat. As soon this meal was made, it was gone; that’s how good it tasted, or was it that we were hungry? hmmm 😉 anyway look out for provision and salt fish, another easy to cook and delicious recipe. 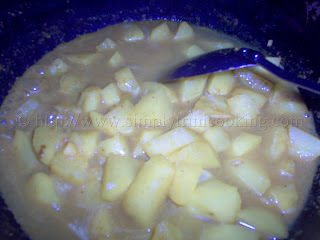 Don’t forget to leave your comments about dosti roti and curry aloo in the comment box below. Thank you for your comment. 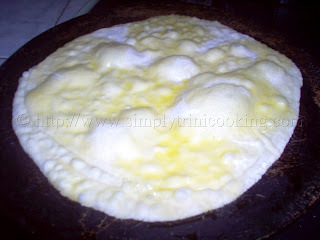 Roti making is just a matter of practice. When kneading the dough it should be soft, so if you used 1 1/8 cups of water and found that the dough was still stiff you could have added a little more water until you got the soft consistency. I did mention to add more water if necessary. The size of the roti is dependent on the size of tawah you have. 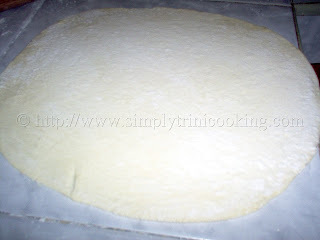 What you should pay attention to rather, is how thin you roll out the roti(about 1/4 inch thick). The thinner the better. 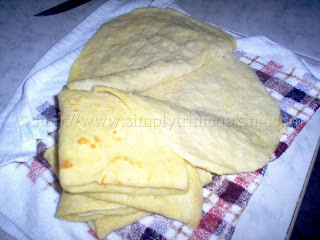 The roti should be cooked on both sides and slightly brown like in the picture. Also note the resting time and you should be on your way to making the perfect two in one roti. Hope this helps. If you have any questions feel free to write again. N.B. Make sure to saparate the roti when hot. what type of curry do you use? I don’t think the type of curry really matters but if you want to know it’s madras curry. Any brand will do be it Chief, Turban or Caribbean Spices. Hi… I’m a little confused as to how the dosti roti differs from the sada roti? Is the difference that you just singe the ends in the sada? Dosti Roti is also called two in one roti so you’re getting 2 when you roast one roti. That’s the main difference. But, in a sense, the recipe ingredients are basically the same except for the oil used to separate the two rotis in the dosti roti. Is the water measurement one cup plus one eighth or is it use only 1 one eighths cup? It’s 1 and 1/8 cup. Well, Pat I’m still learning as well so we have something in common lol. Thank you for visiting.